Roaster: Kaldi's Coffee Roasting Co. Immediately upon smelling, the aromas of grapes, currants, nuts, and sweet dried fruits were intensely present. The body was round, full, juicy, and overall smooth. Tons of fruit acidity was easily identifiable, but it never seemed to overpower the cup due to the highly impactful sweetness. Notes of peach, plum, blackberry, orange, black currant, wildflower honey, and caramel all played very well together. Soft tannins, malts, and a touch of cinnamon created a highly complex and pleasing experience. As the coffee lingered, it brought back more malts and honey in a light glow. Categories: Coffee Ratings. Origins: Kenya. Flavors: Black Currant, Blackberry, Caramel, Cinnamon, Malt, Orange, Peach, Plum, and Wildflower Honey. Brew Descriptors: Baking Spices, Fruity, and Full Body. 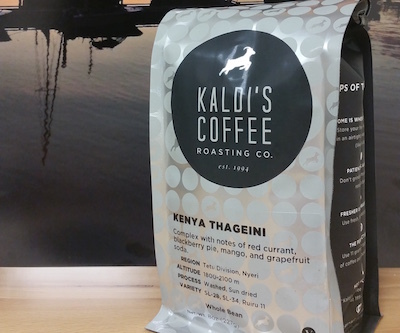 Roasters: Kaldi's Coffee Roasting Co.